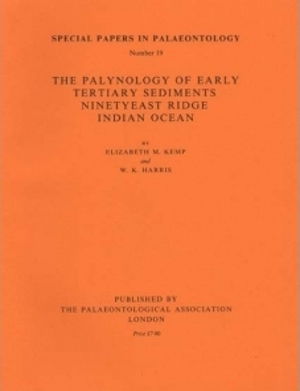 KEMP, E. M., HARRIS, W. K. 1977. . Special Papers in Palaeontology, 19, 1–70. Assemblages of spores and pollen are recorded from volcanogenic sediments immediately above oceanic basement at drill sites on the Ninetyeast Ridge, Indian Ocean, and are believed to reflect the vegetation of islands which were emergent along the ridge crest in the Palaeogene. At Site 214, the assemblages were recovered from sediments interpreted, on foraminiferal, coccolith, and palynological evidence, as being of mid Palaeocene age. At Site 254, age estimates are ambiguous, but the palyniferous unit is overlain by units dated as middle to late Oligocene on foraminifera1 evidence, and seems likely to be Oligocene itself. A total of seventy-one form-species has been identified from the sites. Fourteen of these are instituted as new species, and include Arecipites insularis Harris, Cicatricosisporites teniatus Harris, Appendicisporites crassicarinatus Harris, Echiperiporites rotundus Kemp, Myrtaceidites oceanicus Kemp, Nyssapollenites deminutus Harris, Punctatosporites varigranulatus Kemp, Rhoipites grandis Kemp, R. isoreticulatus Kemp, R. microluminus Kemp, Sparganiaceaepollenites irregularis Kemp, Stoverisporites verrucolabrus Kemp, Simpsonipollis mulleri Kemp, and Tricolpites discus Harris. Assemblages from both sites have much in common with Early Tertiary microfloras from Australia and New Zealand ; of the total number of form-species, forty-two have been previously described from Australia, seventeen from New Zealand. Families occurring in the island floras which have a general southern distribution include Myrtaceae, Proteaceae, Restionaceae, Gunneraceae, Chloranthaceae, Araucariaceae, and Podocarpaceae. Although reconstructions of the Indian Ocean suggest that the island sites were closer to southern land masses than they are now, it seems that they were truly oceanic in position, and it is argued that establishment of the floras must have occurred through long-distance dispersal mechanisms; the present paper elaborates and formalizes the systematic description of spore and pollen species present at each of the sites. Microfossil of fungal origin from Site 254 are treated in a separate publication (Kemp, in press). A full account of the phytogeographical implications of these ancient island floras is given elsewhere (Kemp and Harris 1975).